Do you have any idea how difficult it is convincing you to abandon your news, sports and entertainment sources long enough to read about our exciting world of city government? It’s plenty tough, believe me. In 2014, as with previous years, we tried to present you with useful, reliable information through this blog. It seemed to have worked: There were more than 57,000 views to 120 blog posts. Which ones were the most popular? Glad you asked. Based on number of views, here are the top five posts that earned your interest and attention. Just in time for Aggie football home games, this one tackled the serious issues created by illegal parking; especially, in our historic South Side neighborhoods near Kyle Field. Don’t forget these tips when next season comes around, okay? In November, the College Station Police Department made us aware of a troubling trend that emerged in a matter of days. Two dozen people were hospitalized and one died due to ingesting illegal synthetic drugs. Know the symptoms to watch for. Honestly, these are pretty no-brainer tips for peace and harmony. But they tend to be the ones students don’t think about and, as a result, they occasionally run into problems with neighbors or with the city. Sharing is caring, so be sure your student neighbors know about these. This post actually debuted in fall 2013, right after College Station Utilities launched a new outage reporting system. Since our population is so transient, this step-by-step guide continues to remain relevant for new residents and new students, as well as our longtime citizens. I rarely author blog posts, but this subject was near and dear to me. Commemorative light posts and memorial plaques to each of the 12 Aggies killed in the 1999 Bonfire collapse adorn beautiful Brison Park in College Station. Never been there? Now that it’s been 15 years since the tragedy, this post might inspire you to visit this beautiful and serene spot. 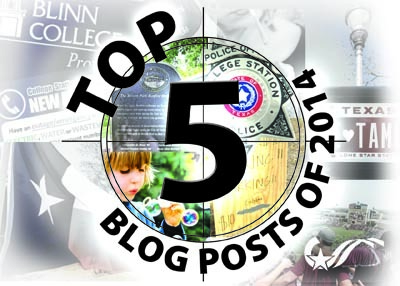 We hope you enjoy and find value in the City of College Station Blog, and thanks to all of you responsible for the 57,000 views in 2014. Tell a friend about us and we’ll continue to work hard for you in 2015. Oh, one more thing: For those who aren’t fulfilled by Top-5 offerings, these round out the Top 10, based on number of views. Jay Socol is in his sixth year as College Station’s public communications director. A 1991 graduate of Texas A&M, Socol has also been communications director for the Texas A&M Engineering Extension Service, public information officer for the City of Bryan, and news director at several B-CS radio stations. This entry was posted on December 31, 2014 by City of College Station. It was filed under Public Communications and was tagged with code enforcement, electric utility, Growth, neighborhood parking, parks, Police.